Looking for Hall Hire in Newbury ? Why hire a hall when you deserve a 3 star hotel! Our unbeatable deal makes arranging a party as easy as 1-2-3. All you need to do is pick your date and the room, disco and bar are booked for you saving you time and money. Our party package gives you 4 hours party time, a professional disco supplied by ourselves, your own private bar and dancefloor. Click the contact link on the menu to navigate to our contact page. Here you will find email, telephone number and contact form. 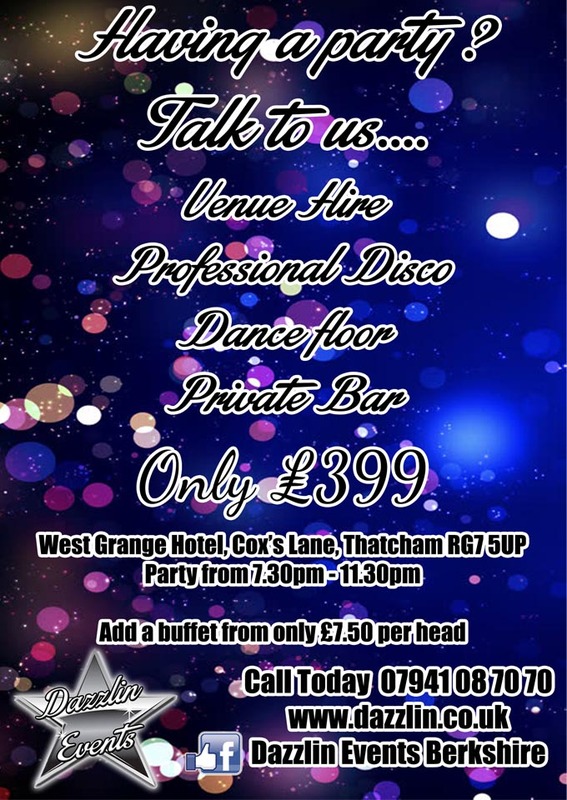 The venue we use is The Mecure West Grange Hotel Thatcham. This is a purpose built room that includes a licensed bar and is fully air conditioned. Do I get time before to set up? With our party deal you get 4 hours of party time. You are also welcome to come in before your 4 hour slot commences to set up the room. Only alcohol purchased from the venue can be consumed within the party room. No you are unable to provide your own food within our venue however buffets are available from only £7.50 per head. Do you do 18th or 21st parties? Yes we are one of the only companies offering 18th and 21st party packages. Click our services link to access this page. These party package are not available at this venue.